Friday evening we dined at Al Rolo in the DoubleTree Hilton Hotel, where we were staying in the Del Higueron Resort. The last time we ate here was last year on Christmas Eve and it was a fantastic occasion. We opted for a late dinner around 9pm and were greeted by very attentive staff. Al Rolo Restaurant is a fusion restaurant that combines tasting “design tapas in a bodega style space and A la Carte with a Mediterranean stylish gastronomic selection”, called “The elements”. The menu selection was good and varied, there were your a la carte options and some tapas dishes to choose from. For starters we opted for the Asparagus with poached egg and shaved truffle and Octopus salad with sorbet. Which were beautiful in appearance as well as taste. For main my husband had the Wagu beef and I had the Lobster with noodles, which was actually a thinner tagliatelle in a creamy sauce and it was gorgeous, very filing indeed as the lobster was so meaty. Desserts we decided to order two and share them, they were fresh Strawberries served in a plant pot of clotted cream and Lady fingers, mousse and a violet ice cream. Delicious and the violet ice cream was a winner! We drank a rose wine and sparkling water with our meal and we were given complimentary fizz to end our meal by the waiter. Another lovely touch too end a lovely evening at Al Rolo. The total bill was €115 and we throughly enjoyed the food. It is a very nice restaurant, with great staff and I would not hesitate to eat here again. If you are ever in the area please try. Saturday we dined at La Solana in Fuengirola, this is a favourite of mine as we have previously eaten here. La Solana is a family run restaurant, if you are wanting high quality food with a friendly and welcoming service then this restaurant is for you. Some of their food comes from family run farms and they have a certain bottle of rose called Vina Perguita, that is their own wine from family vineyards in northern Spain. Their food is presented amazingly well and the little niblets and palette cleansers brought before and after dishes are delightful and different. We were served some pre dinner offerings of cheese, spanish ham and tomato with a sauce on a stick, that melted in your mouth and a tomato and cheese shot. Starters we chose were the Gourmet mini burgers with salad and wedges for myself, delicious is not a strong enough word for these burgers, you get two and the sauce that is spread on them is moreish and my husband opted for the Prawn salad, enough for a family, the portions are very generous. After our starters we were given a palette cleanser shot of a mixture including mint basil and apple. Main course we both had fish, as it is caught daily and their is always a good choice, as well as being ultra fresh. my husband opted for the Tuna and I for a freshly caught white fish, that is similar to sea bass, a little thicker. My fish came with vegetables and a carrot sauce, that was so creamy I had to ask how it was created, the owner replied “just carrots whizzed up, no cream no nothing” it was a delight!!! The rose house wine from the north of Spain accompanied the meal, which I enjoyed so much due to it ease at drinking, I purchased another bottle for home. There is always room for a desert, again we picked two and shared both, a red brownie desert that was light as a feather and a dream to eat, alongside a banana and toffee mousse that I could eat forever more. Again La Solana delivered a flavoursome, delectable and pleasurable delight, you must eat here. Next chance we get we will return! Our last night we went to Mijas and ate at Olivias. Known in the UK especially due to TOWIE (The Only Way Is Essex) the TV reality show. Olivia’s is owned by Elliot Wright, who starred in the show. I wanted to try the restaurant and see if it lived up to my already high expectations. It is situated on the “golden sands of La Cala beach” and it is the result of Elliot’ dream, “This small piece of paradise has been my dream for 15 years. Beach-side dining under the stars with panoramic views. Fine food and fine company.” The restaurant itself is impressive on arrival and you can see the attention to detail in every aspect of the place, including the toilets. It certainly brings the glamour to this part of coastal Spain. We were welcomed by friendly staff, taken through to our table. The restaurant and bar area are modern and well furnished to a very high standard. Live music was on in the form of a male singer. We ate from the set menu which is €29 for 3 courses which was well priced. 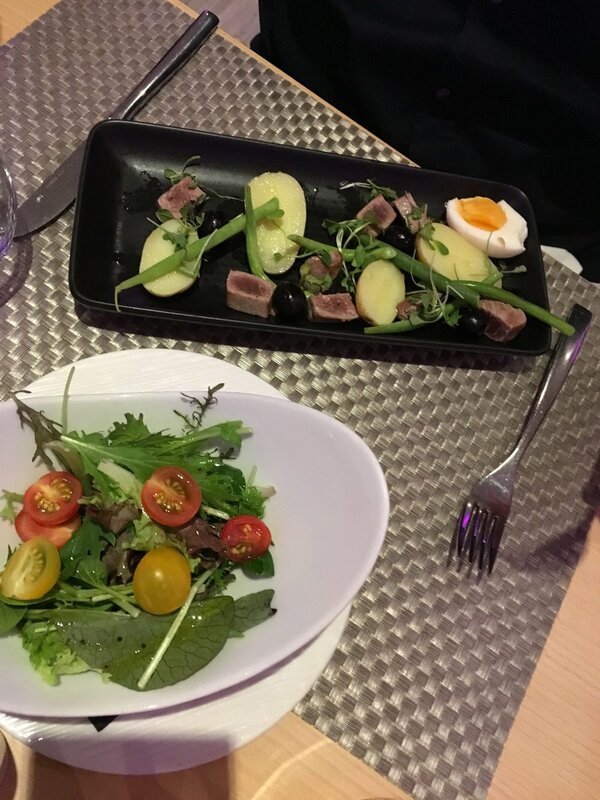 My hubby opted for the Tuna nicoise and I chose the Prawn salad. We both decided on the Thai green chicken curry and rice. Our desserts, again shared were the Sticky toffee pudding and a Apple crumble with a Tahitian custard. We drank, Hibiscus gin and tonic for me, that was lovely and a first try and beer for my husband. All the food was plentiful, tasty and nicely presented to us, we would definitely eat here again. Whilst we were there we got chatting to the staff, who were lovely, very friendly and attentive to all your needs. They showed us upstairs into the Champagne and Sushi Bar with a terrace, which looked amazing. Will return to eat here in the future. After we ate we stayed for drinks in the bar area, the cocktails were amazing, especially Elliot’s Pornstar Martini with a shot a champagne. Well worth 14 euros. Total bill for the evening with a few rounds of drinks was €120. All staff were great to chat with and were happy to tell you about the area and the restaurant. Elliot’s brother Edward was managing the restaurant that night and was a real gent, a pleasure to meet and graciously agreed to a selfie (I know I have no shame). Olivia’s lived up to all the hype I expected, as well as offering a warm and welcoming environment for its customers. Keep up the good work. After three beautiful meals, it was time to return back to blighty. I look forward to my return to southern Spain with delight.